A migraine headache is a vascular headache. It involves the excessive dilation or contraction of the brain's blood vessels. The word migraine is derived from the Greek hemikrania, which means, "half a skull" or "crown". Nausea, vomiting, blurred vision and tingling and numbness in the limbs usually accompany a migraine headache. One can last up to eighteen hours. A classic migraine is preceded by a set of symptoms referred to as an aura. An aura consists of speech disorders, weakness, and disturbances in the senses of vision and/or smell. Visual effects can include brilliant stars, sparks, flashes or simple geometric forms passing across the visual field. If you are a susceptible individual, any number of things can trigger a migraine; including low blood sugar, which is the most frequently -reported cause. The lower the blood sugar level during an attack, the more severe the headache can be. Foods that either effect the blood sugar level or can effect blood flow are chocolate, citrus fruits, anything containing alcohol (especially red wine), any foods that are aged, cured, pickled, soured, yeasted or fermented, and allergies. Smoking, because the carbon monoxide in the substance expands the blood vessels and the nicotine contracts them, often triggers migraines--especially in individuals who do not smoke, but are exposed to the second-hand smoke of others. Constipation (which is usually caused by dehydration, another cause), stress, liver malfunction, too much or too little sleep, emotional changes, hormonal changes, sun glare, flashing lights, dental problems, lack of exercise and changes in barometric pressure have also been reported to trigger these headaches. Over-the-counter painkillers although not classified as triggering a migraine headache, wear off and can leave you with a worse headache than before. After that, a person tends to think he or she needs more painkillers each time. Eventually the pills have little or no effect. If you want to avoid overdosing on painkillers before they kill you, and not just the pain, these are best to avoid. Who is affected by this disorder? About 10% of the population of earth is plagued by migraines of some kind. In the United States, statistics show us, on a limited study, that 8.7% of females are afflicted by migraines while 2.6% of males are affected. The higher occurrence of migraines in females is probably due to hormone fluctuations. They occur more often between the ages of 20 and 35 in adults; frequency decreases with age. In children, migraines may be misdiagnosed as colic, periodic abdominal pains, vomiting, dizziness or severe motion sickness. According to the United States Centers for Disease Control and Prevention, there was an increase of 60% in migraine headaches on all age groups during the 1980's through the 1990's. In one study, those persons who had taken between 3 to 6 1,200 mg capsules of Lecithin when they felt a migraine coming reported fewer, milder headaches. You can also take Lecithin in granulated or powdered form. Do not take niacin if you have high blood pressure, liver disorder or gout. Ensure you are taking at least 200 mg of rutin as part of your Vitamin C complex. Vitamin C aids in producing anti-stress adrenal hormones and enhances immunity. Rutin removes toxic metals, which can cause migraines. Bio Rizin (from American Biologics) contains licorice extract which helps to improve your energy level and relieve allergy symptoms that can trigger migraines. Do not use this herb on a daily basis for more than seven days in a row. Avoid it if you have high blood pressure. Garlic is helpful and is a potent detoxifier. Garlique brand Garlic tablets or other, comparable brands on the market contain at least a clove of garlic (allium sativum) or 400 mg., equivalent to taking 1,200 mg of fresh garlic. Taken once a day, it also regulates cholesterol. It is helpful in regulating blood pressure levels as well. If you are taking a good Vitamin B Complex in 100 mg doses daily, ensure that your Vitamin B complex has at least 100 mg of pantothenic acid (Vitamin B5) in it. Take an additional 100 mg of this daily. It is needed by the adrenal glands when the body is under stress. Another form of Vitamin B5 is royal jelly. You can substitute 1 teaspoon full once or twice a day. Increase your intake of pyridoxine, Vitamin B6 by 50 mg. It is required for normal brain function. Use a hypoallergenic form. One recommendation is to add Taurine Plus from American Biologics, 10 to 20 drops a day, taken under the tongue. It is an important antioxidant and immune regulator. It is needed for white blood cell activation and neurological function. Do not use wormwood during pregnancy; it is not recommended for long-term use. A study conducted by The University of Nottingham in England on its effects upon migraine suffers, has shown that participants who took the herb, feverfew, had an average of 24 percent fewer migraine headaches than those who did not take it. Other findings were the reduction of vomiting and other side effects. Avoid foods that contain the amino acid tryamine. These include aged meats, avocadoes, bananas, beer, cabbage, canned fish such as sardines and tuna, dairy products, eggplant, hard cheeses, potatoes, raspberries, red plums, tomatoes, wine, and yeast products. Also avoid alcoholic beverages, aspirin, chocolate, monosodium glutamate (MSG), nitrate preservatives such are found in hot dogs and lunchmeats. Avoid spicy foods, and salt and acid-forming foods such as meat, cereal, bread and grains, fried foods and fatty greasy foods. Eat small meals, and if you have snacks, make them small as well. This will assist in stabilizing any wide swings in blood sugar that may precipitate a migraine. Make sure to get regular, moderate, exercise. Massage the back of your neck and head daily or have a professional massage those areas for you. Handle any problems with your teeth that could trigger a migraine. There is a treatment for those that have had migraines brought on by coffee or caffeine. At the first suspicion that a migraine is about to start, drink one or two cups of strong black coffee, and then lie down in a dark, quiet room. In order for this treatment to be effective, you must not consume any other form of caffeine. This would include cocoa, chocolate, decaffeinated products of any kind (as they have some small amount of caffeine in them), soft drinks with caffeine and any over-the counter or prescription medications that contain caffeine. Never discontinue a prescribed medication or change the dosage without consulting your physician first. When you know you are susceptible to migraine headaches, smoking is not an option. Avoid smoking at all costs, especially second-hand smoke, which is twice as potent for a non-smoker than it is for those people who do smoke. It could make you very ill. The nicotine from tobacco can trigger a flush reaction that can bring on a migraine. It can also impair your lungs from taking in enough oxygen to feed the brain. A study reported in the British medical journal The Lancet stated that food allergies could be detected and that when specific foods were eliminated from the diet of those who had suffered from migraines, as many as 93 percent of them found relief. It would be interesting to see from future studies which foods are most used by migraine suffers to possibly determine cravings, addictions or patterns in eating that may need to be addressed as well. 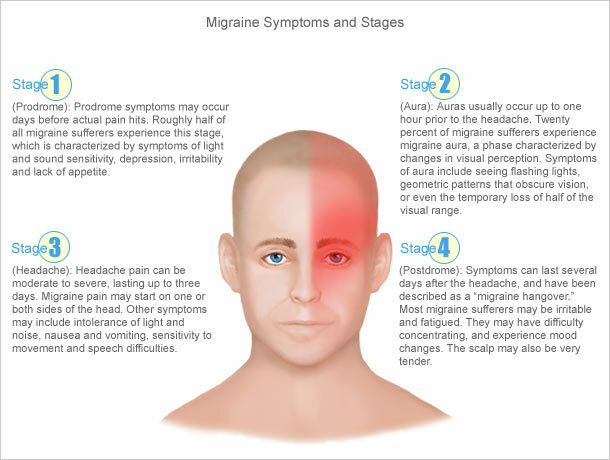 Studies of magnetic therapy have shown that the north pole of a 4-by-6 ceramic magnet, applied to the area in pain, has brought relief to a significant number of migraine sufferers. Sleeping with these magnets applied directly to the head, or larger magnets placed suspended over the head, can affect a more lasting result. Mellitin: This can show to be 100% more potent then hydrocortisol as an anti-inflammatory agent. Mast Cell Degranulating Peptide: This can help to increase short term memory. Apamin: Enhances long term synaptic transmission and shortens duration of nerve action potential. Hyaluronidase: Acts to rid the cells of toxins, allowing healing substances to reach the cells. Dopamine: A neurotransmitter that increases motor activity. Adolapin: Works as an analgesic. Studies have shown that biofeedback is good for lessoning the severity and the frequency of migraine headaches. It is usual for a person at the onset of a migraine headache, to have his or her hands cool down to as low as 65 Degrees Fahrenheit. One way to avert this is by raising the temperature of a person's hands. If you are trained in biofeedback techniques, you utilize breathing techniques that raise your body temperature to prevent this. Taking hot showers or baths is another good way to approach this. Some kinds of music have a calming effect and can help to relieve migraines. These can include soft melodic music as well as the sounds of nature. They assist us to relax and unwind from any over stressful relationships of the day. If migraines are caused by imbalance in your cell or tissue salts you may want to consult a naturopathic doctor or have them test you for which ones you are lacking in. Very often the biochemical treatment for migraines that are accompanied by nausea and bitter taste in your mouth. Migraines, in this case, may worsen in damp weather or very warm weather. This may be remedied by including more of the tissue salt Sodium Sulphate in your diet. Women who are affected by migraine headaches, may benefit from the use of natural progesterone cream. The drug most commonly prescribed for the relief of migraine headaches is called ergotamine. It is sold under the brand names of Cafergot, Ergostat and Wigraine. These can be addictive and should not be taken for more then two days in any one week. Cafergot and Wigraine also contain caffeine. A relatively new drug, sumatriptan (Imitrex), relieves acute migraine headaches by increasing the amount of serotonin in the brain. Clinical studies have shown that 82 percent of people who have migraine headaches who took sumatriptan, improved within two hours of treatment. A majority taking this treatment, 65%, were pain-free. This drug is administered in injection form and is sold in home injection kits. There are side effects that include dizziness, drowsiness, malaise and anxiety. Sumatriptan is not for all migraine headaches sufferers, because it can potentially cause coronary artery constriction. It should not be administered at all to anyone who has angina or a history of heart attack. It may also cause high blood pressure so that people with uncontrolled hypertension (high blood pressure) should not take this drug. Other drugs that are administered as preventatives rather than as therapy for acute attacks of a migraine headache include amitriptyline (Elavil, Endep), diazepam (Valium), methysergide (Sansert) and propranolol (Inderal). This form of a headache is accompanied by severe throbbing pain and often affects one side of the head, usually centered at the temple or behind one ear. This form of a migraine headache can be accompanied by nausea, vomiting, cold hands, dizziness, sensitivity to light and sounds, blurred vision, and tingling and numbness in the limbs; and can last up to eighteen hours. It usually comes on slowly and lasts from two to seventy-two hours. Like the classic migraine headache, it, too, is caused by the excessive dilation or contraction of the blood vessels of the brain. Treatments for common migraine headaches are the same as covered in the previous section.